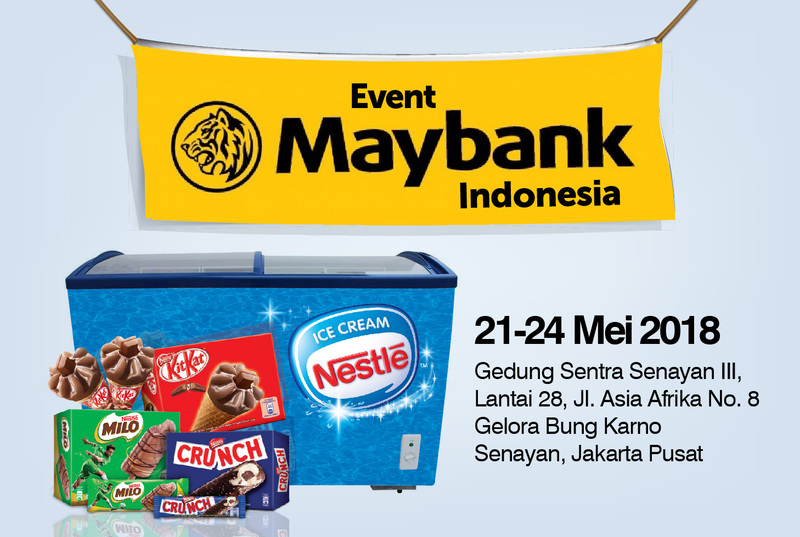 Nestle Ice Cream Pop Up Event with Maybank Indonesia. With purpose to create a moment of happiness between each other by sharing Nestle ice cream, we collaborated with PT. Aeon Indonesia in Maybank Indonesia event. The event itself held on 21st-24th of May 2018 precisely at Sentra Senayan III Building, 28th floor, located at Asia Afrika Street no 08, Gelora Bung Karno, Senayan, Central Jakarta. This 4 day event not only gave the exposure for our ice cream products to the community, but also sharing a happiness with the delicious ice creams such as milo ice cream, crunch ice cream, and our new product, kit-kat ice cream. The response for this event was suprisingly good. Although the event held on a fasting moment, visitors still came and interested with the ice creams. Not only that, many people also bought the ice creams for breaking their fast. Overall, we got many positive feedback regarding the event and the ice creams itself. We also got suggestion to do another pop up event for Nestle ice creams. Of course we would like to do that. And if you want to collaborate with us for your event please contact us through the email. Don’t forget to follow our social media at instagram @kaf_mart for more updates regarding our next event.